The research, published in Nature, has implications for our understanding of the early solar system. PROVIDENCE, R.I. [Brown University] — Around 3.8 billion years ago, an asteroid more than 150 miles across, roughly equal to the length of New Jersey, slammed into the Moon and created the Imbrium Basin — the right eye of the fabled Man in the Moon. This new size estimate, published in the journal Nature, suggests an Imbrium impactor that was two times larger in diameter and 10 times more massive than previous estimates. These new findings help to explain some of the puzzling geological features that surround the Imbrium Basin. The work also suggests — based on the sizes of other impact basins in the Moon, Mars and Mercury — that the early solar system was likely well stocked with protoplanet-sized asteroids. The Imbrium Basin — seen from Earth as a dark patch in the northwestern quadrant of the Moon’s face — measures about 750 miles across. The basin is surrounded by grooves and gashes, large enough to be seen with even small telescopes from Earth, created by rocks blasted out of the crater when it was formed. These features, known as the Imbrium Sculpture, radiate out from the center of the basin like spokes on a wheel, but are concentrated on the basin’s southeast side. That suggests that the impactor traveled from the northwest, impacting at an oblique angle rather than straight on. But in addition to features radiating from the basin’s center, there is a second set of grooves with a different alignment. These appear to come from a region to the northwest, along the trajectory from which the impactor came. Through hypervelocity impact experiments performed using the Vertical Gun Range at the NASA Ames Research Center, Schultz was able to show that those grooves were likely formed by chunks of the impactor that sheared off on initial contact with the surface. The grooves created by those chunks enabled Schultz to estimate the size of the impactor. The Vertical Gun Range employs a 14-foot cannon that fires small projectiles at up to 16,000 miles per hour, while impact plates and high-speed cameras record the ballistic dynamics. 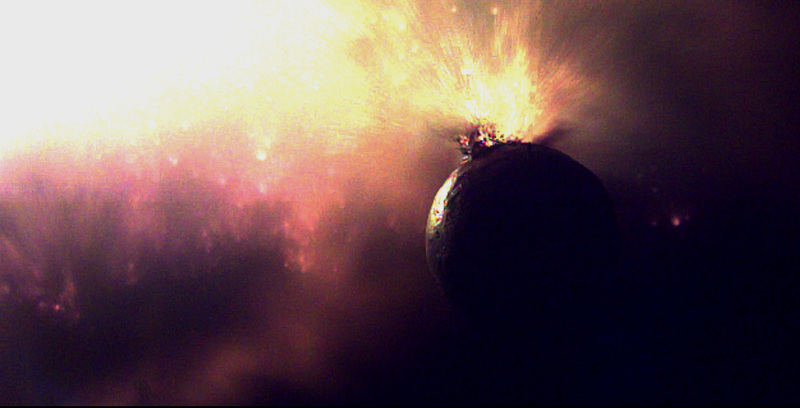 During his experiments with low-angle impacts, Schultz noticed that impactors tend to start breaking apart when they first make contact with the surface. That point of initial contact is actually behind or “up-range” of the final crater, where the bulk of the impactor digs into the surface. The chunks that break off up-range of the final crater continue to travel at a high rate of speed, scouring and grooving the surface. After seeing these features in the lab, Schultz worked with David Crawford of the Sandia National Laboratories to generate computer models showing that the same kind of physics would also happen at the colossal scales of a lunar impact. 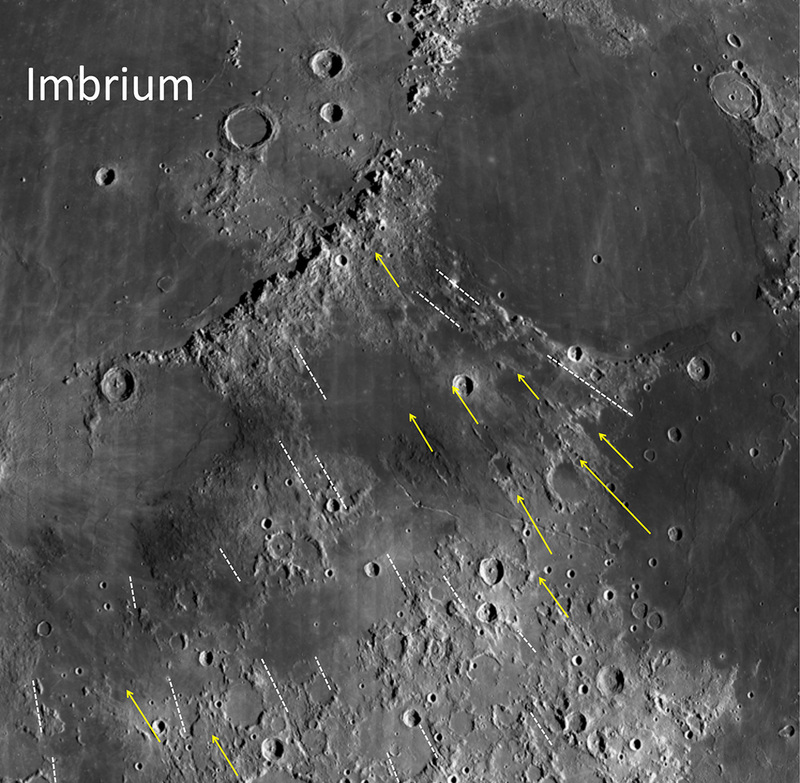 With an understanding of how those grooves were created, Schultz could use them to find the Imbrium impact point. And because the fragments would have broken off from the either side of the impactor, the groove trajectories could be used to estimate the impactor’s size. Those calculations yielded an estimated diameter of 250 kilometers or 150 miles across, large enough for the object to be classified as a protoplanet. Schultz and his colleagues used similar methods to estimate the sizes of impactors related to several other basins on the Moon created by oblique impacts. Those estimates — for the Moscoviense and Orientale basins on the Moon’s far side — yielded impactor sizes of 100 and 110 kilometers across respectively, larger than some previous estimates. Combining these new estimates with the fact that there are even larger impact basins on the Moon and other planets, Schultz concludes that protoplanet-sized asteroids may have been common in the early solar system. “The large basins we see on the Moon and elsewhere are the record of lost giants,” Schultz said. The research has several other significant implications, he said. The surviving fragments from these impactors would have littered the ancient surface of the Moon, slowly becoming mixed with native soil and rock. That could help explain why samples returned from the Apollo missions had such a high meteoritic content. That is particularly true of Apollo 16, which landed downrange from the Imbrium impact. Furthermore, Schultz’s work suggests fragments from these giants could account for a many of the impacts that occurred during a period called the Late Heavy Bombardment, which occurred from about 3.8 billion years ago to around 4 billion years, when scientists think most of the craters we see on the Moon and Mercury were formed. The impact models Schultz and Crawford developed suggest that thousands of the chunks that crumbled off of the Imbrium impactor and others would have broken and kept going, escaping the Moon’s gravity and flying off into space. On subsequent orbits around the sun, those chunks would have crossed the Earth and Moon orbits again and again, creating a strong possibility of subsequent impacts. Some of those objects would have been a kilometer or two across, large enough to create 20-kilometer craters. “These chips off the old blocks could have contributed significantly to the impact record we see on the Moon and other terrestrial planets,” Schultz said. Schultz also said he continues to be amazed by what we can learn just by looking up at the Moon. The research was funded in part by a grant from NASA (NNX13AB75G).